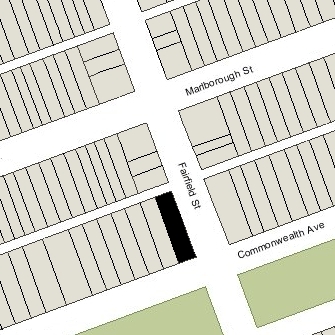 21 Fairfield is located on the NW corner of Fairfield and Commonwealth, with 9 Fairfield to the north, across Alley 427, 29 Fairfield to the south, across Commonwealth, 239 Commonwealth (22 Fairfield) to the east, across Fairfield, and 245 Commonwealth to the west. 21 Fairfield (243 Commonwealth) was designed by architect William Whitney Lewis and built in 1880-1881 by Standish & Woodbury and John Morrison, builders. It was built as the home of iron and steel manufacturer George Parsons King and his wife, Sarah Williams (Lothrop) King. They lived at the Hotel Vendôme while it was being built. George King is shown as the owner of 21 Fairfield on the original building permit application, dated November 2, 1880. He purchased the land for 21 Fairfield on April 24, 1880, from the estate of William Powell Mason. William P. Mason had purchased the lot on March 15, 1866, from a real estate investment trust formed by John Templeman Coolidge, Franklin Evans, and Charles Henry Parker. The lot was part of one of several parcels the trust purchased from the Boston Water Power Company on January 29, 1866. The trust subsequently subdivided the parcels into lots, which it sold to investors and builders, who then frequently resold the lots to others. Click here for an index to the deeds for 21 Fairfield. During the 1884-1885 winter season, the Kings were living elsewhere and 21 Fairfield was the home of Charles Francis Adams, Jr. and his wife, Mary Hone (Ogden) Adams. Charles Adams, Jr., was an attorney and president of the Union Pacific Railroad. They also maintained a home in Quincy. 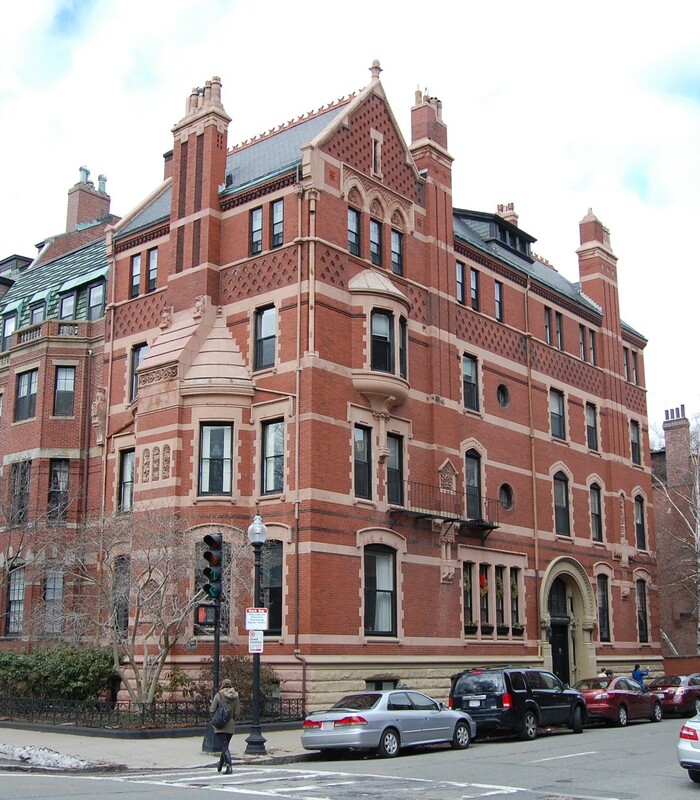 They continued to live at 21 Fairfield during the 1885-1886 season, but moved soon thereafter to 261 Clarendon. By the 1886-1887 winter season, 21 Fairfield was once again the Kings’ home. They continued to live there until shortly before his death in September of 1895, By 1896, Sarah King was living at The Empire at 333 Commonwealth. During the 1894-1895 winter season, 21 Fairfield was the home of Louis Cabot and his wife, Amy (Hemenway) Cabot. They also maintained homes in Brookline and in Dublin, New Hampshire. By the 1895-1896 winter season, 21 Fairfield was the home of Edwin Carlton Swift and his wife, Florence Abbott (Bailey) Swift. They previously had lived at 167 Commonwealth. Edwin C. Swift and his brother, Gustavus Franklin Swift, founded the meat packing company, Swift Bros. & Co. (later known as Swift & Company). The Swifts initially leased 21 Fairfield from George King’s estate. On March 2, 1898, it was purchased from the estate by David M. Anthony of Fall River, a business associate of Edwin Swift, and on March 17, 1898, Edwin Swift purchased the house from him. 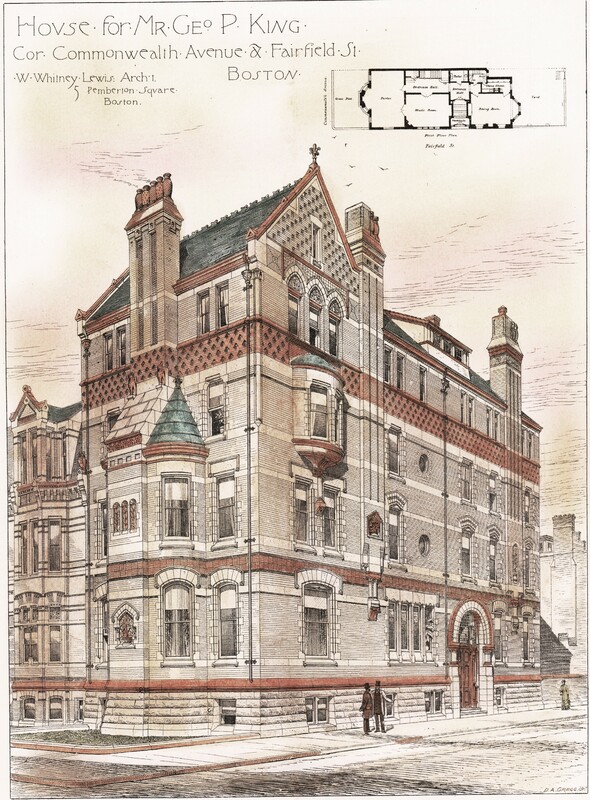 By the 1898-1899 winter season, the Swifts had moved to the Hotel Touraine (southeast corner of Boylston and Tremont). 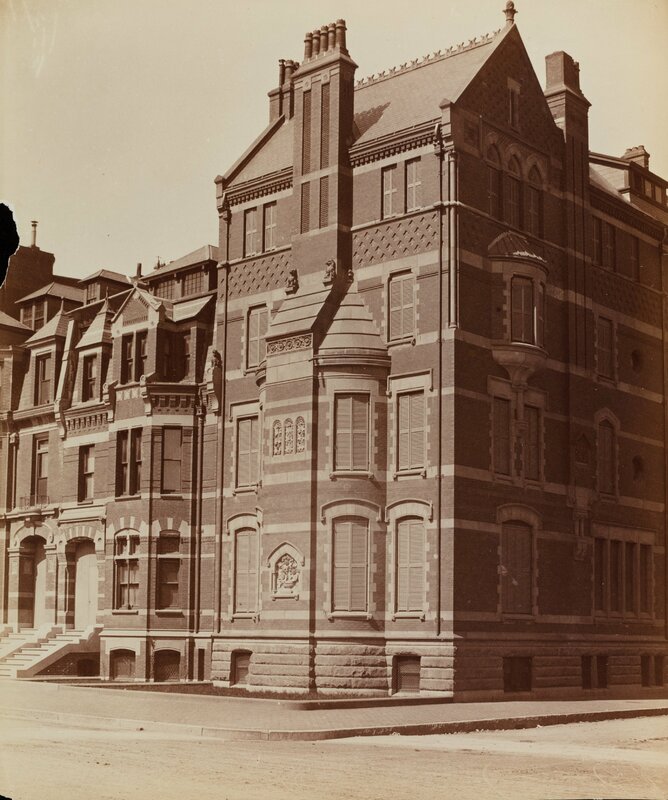 In 1899, the Swifts had drawings made by McKim, Mead, and White for a new Boston home at the northeast corner of Beacon and Hereford (which was a vacant lot at the time). 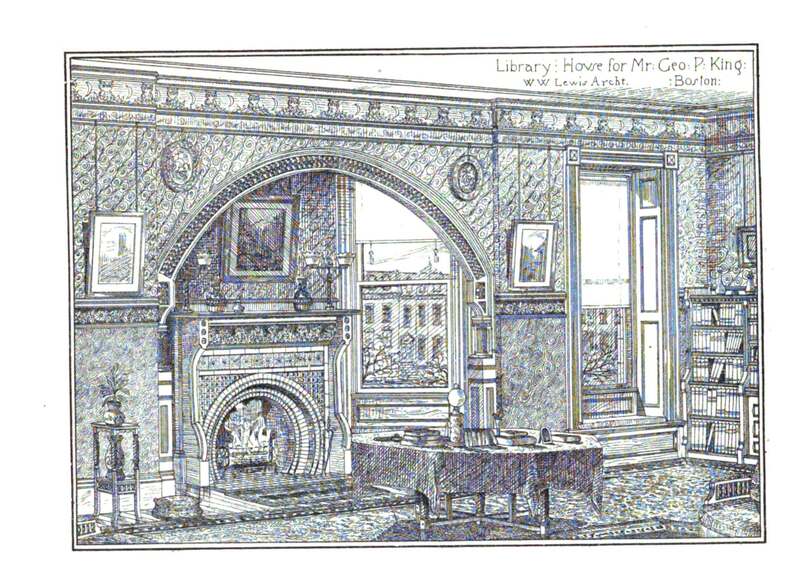 Drawings for the house are included in the McKim, Mead and White Architectural Records Collection (reference PR 042) at the New York Historical Society. The house was not built and, in about March of 1899, the Swifts purchased land in Prides Crossing where they subsequently built a home, Swiftmoore, designed by Arthur Little. On May 13, 1898, 21 Fairfield was purchased from Edwin Swift by Mary (DeFord) Bigelow, the wife of copper mine investor Albert Smith Bigelow. They previously had lived at The Tuileries at 270 Commonwealth. 21 Fairfield (ca. 1881), photograph by Albert Levy; Ryerson and Burnham Libraries Book Collection, The Art Institute of Chicago (Digital file #000000_100709-23). The Bigelows continued to live at 21 Fairfield during the 1902-1903 winter season, but moved thereafter to 351 Beacon. On April 11, 1903, 21 Fairfield was purchased from Mary Bigelow by George Robert White. He was managing partner in the Potter Drug and Chemical Company (manufacturers of Cuticura soap) and a real estate investor. 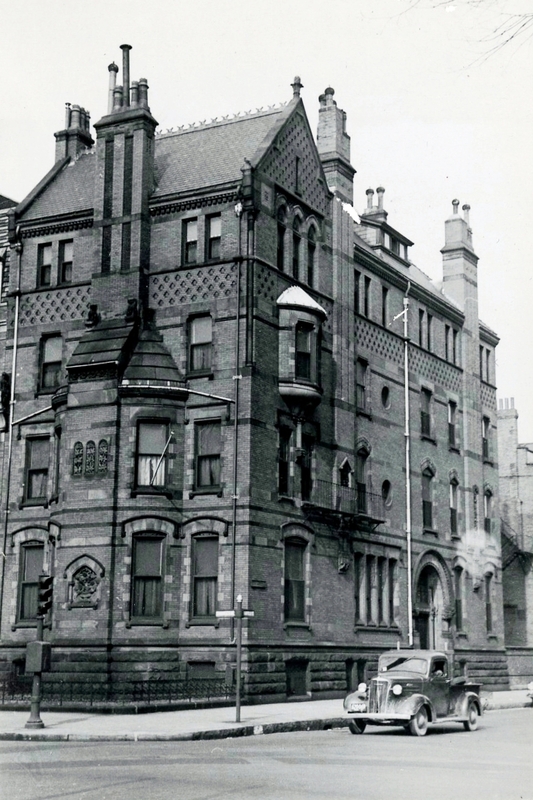 He lived with his brother-in-law and sister, Frederick and Harriet (White) Bradbury, at 197 Marlborough and also maintained a home, Lilliothea, at Smith’s Point in Manchester. George White subsequently reconsidered his purchase and on June 10, 1903, he sold 21 Fairfield to Ellen Wheaton (Ayer) Wood, the wife of William Madison Wood. In August of 1903, George Whte’s sister, Harriet Bradbury, purchased 285 Commonwealth, where she razed the existing townhouse and built a new home. 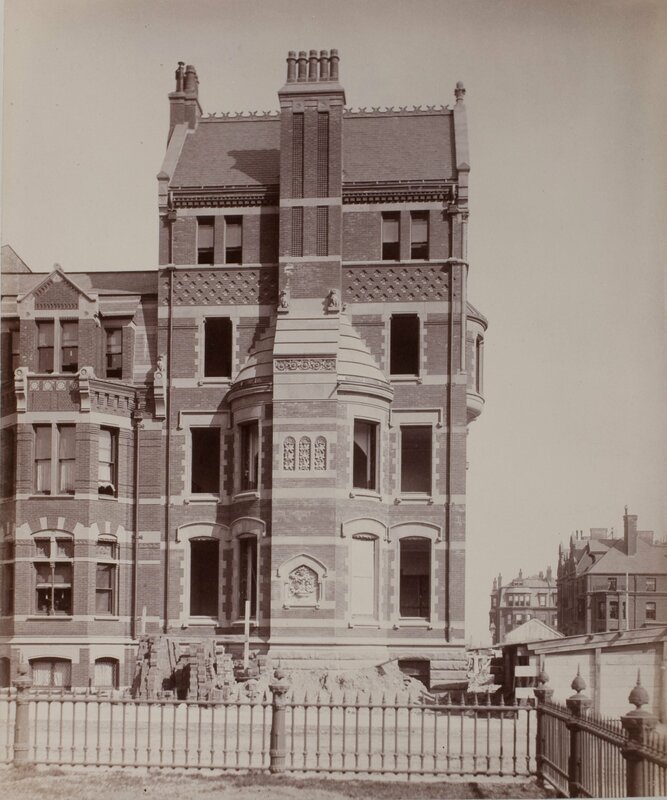 When it was completed, the Bradburys and George White made it their home. By the 1903-1904 winter season, William and Ellen Wood had made 21 Fairfield their home. They previously had lived in Andover, where they continued to maintain a residence. They also had owned 100 Beacon in 1900-1901 and may have briefly lived there. William Madison Wood was the president of the American Woolen Company, which he had founded with his father-in-law, Frederick Ayer, and subsequently built into the largest woolen manufacturing firm in the United States. The Woods raised their four children at 21 Fairfield: Rosalind Wood, William Madison Wood, Jr., Cornelius Ayer Wood, and Irene Wood. In 1912, the Lawrence textile mills were the subject of a major labor strike. In August of 1912, William Wood was indicted for allegedly engaging in a conspiracy to hire men to plant dynamite so that the strikers would be blamed. He was found not guilty in June of 1913. Cornelius Wood, a student at Harvard, married in December of 1915 to Muriel Prindle of Duluth. After graduating in 1917, he joined his father’s firm. They lived in Andover. William Wood, Jr., married in February of 1916, to Edith Margaret Goldsborough Robinson of Louisville. He was associated with his father’s firm and later formed his own wholesale wool firm. After their marriage, they lived with his parents at 21 Fairfield and then at 7 West Hill Place. By the 1919-1920 winter season, they were living at 25 Commonwealth. He was killed in an automobile accident in August of 1922. Irene Wood died in October of 1918. On September 16, 1920, Ellen Wood transferred the property to herself as trustee of the Fairfield Trust. The transfer may have been prompted by litigation filed against William Wood and his company for war profiteering on the sale of wool; the charges were dismissed on the basis that the federal law against war profiteering did not apply to cloth. In 1924, William Wood suffered a stroke. He retired from business, and he and his wife made Florida their primary residence. He committed suicide there in February of 1926. Ellen Wood continued to live at 21 Fairfield with their unmarried daughter, Rosalind. She also maintained a home, Woodstock, in Prides Crossing. Rosalind Wood married in June of 1928 to Count Francesco Mario Guardabassi, a painter and opera tenor. After their marriage, they lived in New York City. Ellen Wood continued to live at 21 Fairfield during the 1927-1928 winter season, but moved thereafter. By 1930, she was spending her winters in Pasadena, California, and her summers at Prides Crossing. On June 24, 1929, she transferred 21 Fairfield to her son, Cornelius Wood, as successor trustee of the Fairfield Trust. On July 1, 1929, 21 Fairfield was purchased from Cornelius Wood by Frank Waterman Stearns and his wife, Emily Williston (Clark) Stearns. They previously lived at the Hotel Touraine (southeast corner of Boylston and Tremont). They also maintained a home in Swampscott. Frank Stearns was president of R. H. Stearns & Company, the retail dry goods store founded by his father, Robert Hall Stearns. He also was a close friend and advisor of Calvin Coolidge, credited with “discovering” him and helping him achieve the governorship and presidency. Frank Stearns died in March of 1939. Emily Stearns continued to live at 21 Fairfield that year, but had moved to Brookline by 1940. The house was shown as vacant in the 1940 City Directory. On June 24, 1940, 21 Fairfield was purchased from Emily Stearns by Germaine Alice (Labrosse) Hubbard, the widow of Walter Erastus Hubbard. She previously had lived in Gardner, Massachusetts. She operated 21 Fairfield as a lodging house, called “The Duchess House.” She continued to live at 21 Fairfield in 1942. The property changed hands and was acquired on November 9, 1943, by the Charles Management Corporation (Nicholas Zavras, president, and Christos K. Patsades, clerk). By 1943, 21 Fairfield was the home of Mrs. Emma G. (Leclaire) Crossett, the former wife of Milton L. Crossett, who operated it as a lodging house. She previously had lived in Waltham. She continued to live 21 Fairfield until about 1952. 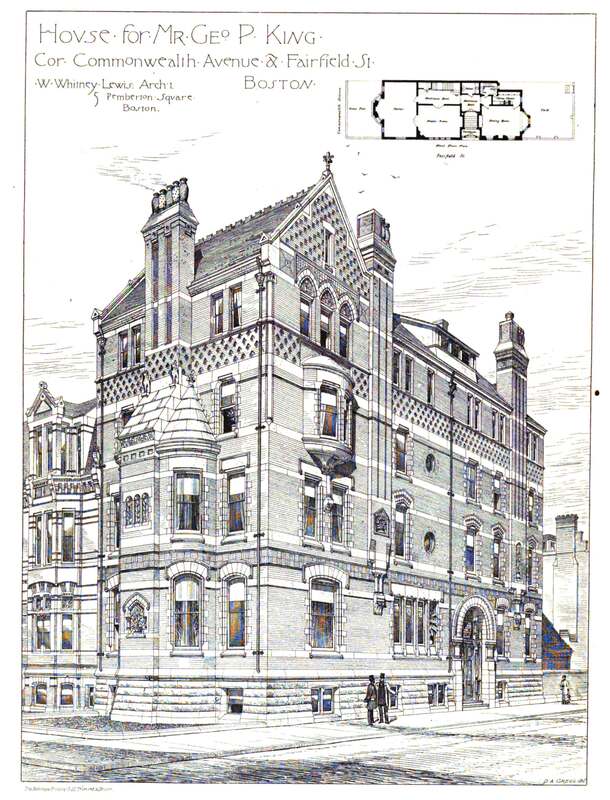 21 Fairfield remained a lodging house, with various operators. On July 5, 1966, 21 Fairfield was acquired from Charles Management Corporation (Christos Patsades, treasurer) by Frank O’Connor. On the same day, he transferred the property to Frank O’Connor Realty Co., Inc.
On May 20, 1976, Frank O’Connor Realty transferred 21 Fairfield to Bernard Rome, the trustee in bankruptcy for Chamberlayne School and Chamberlayne Junior College, which held a mortgage on the property. On May 27, 1976, 21 Fairfield was acquired from Bernard Rome by Christos Patsades, who had been clerk and then treasurer of the Charles Management Corporation. On July 5, 1977, he transferred the property to his daughter-in-law, Joan M. (Kenney) Patsos, the wife of Charles Patsos, as trustee of the Patsades Family Trust-II. On January 23, 1979, 21 Fairfield was purchased from Joan Patsos by David S. Sands and Anthony M. Rando, trustees of the 21 Fairfield Street Trust. In August of 1979, they filed for (and subsequently received) permission to remodel the property into six apartments. On December 12, 1979, they converted the property into six condominium units, the 21 Fairfield Street Condominium.